Ruling Coalition for Democratic Change (CDC) party Montserrado County District #7 Representative Solomon George says plans are underway by the CDC to crown President George Manneh Weah as First Priest and Prophet of Liberia. Making the disclosure over the weekend, Rep. George warned that those making mockery of the President for opening a Church will be cursed by God.The CDC lawmaker was being honored by a group calling themselves “Strategic Journalists Committee,” for his outstanding oversight and representation role played in 2018. Mr. George stresses that President Weah would have been praised if he were to open a Zoe Bush for some ungodly people in the country. 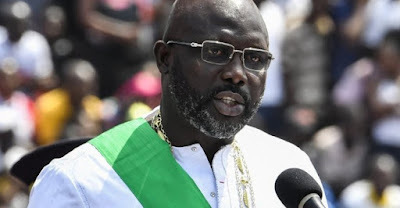 Rep. George argues that no matter President Weah’s affiliation with other secret cults or organizations like the Mason, he will still serve Christ Jesus. Meanwhile, Rep. George has expressed frustration at the first sitting of the 54th Legislature, especially the House of Representatives.He says there are many members of that body who lack the basic understanding of legislative proceedings. According to Rep. George, their actions have greatly obstructed the workings and functions of the Legislature in the past year.He says there are some lawmakers who entered the Legislature with the mindset of making money at the expense of the ordinary people. Mr. George calls on his colleagues to desist from acts that have the propensity to undermine the image of Legislature. During a watch night on December 31, 2018 to usher in the New Year at his newly dedicated Forky Klon Jlaleh Family Fellowship in Rehab, President Weah told his officials to show commitment to their roles and abstain from sabotaging his administration. “You work with government then you want to sabotage the government. You are a Minister in the government but you want to sabotage the government…, he said. He was introduced during the service as Inspirational Leader and not a Pastor, and he used the pulpit that night to deliver the Church’s first sermon.“Let’s forget about all the setbacks in 2018 and focus on the prosperous New Year, what God gave you is enough,” he said.